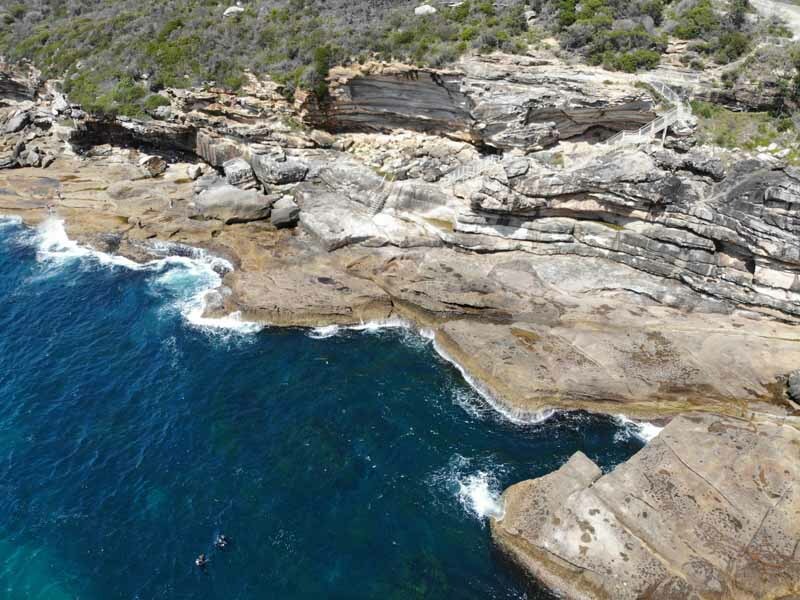 "Inscription Point is a great place to find sea dragons"
Both headlands of Botany Bay are part of Botany Bay National Park. The southern side is known as the Captain Cooks Landing Place section of the national park and is accessed from Captain Cook Drive at Kurnell. One of the normal shore dives here is called The Leap. Sometimes when we go out boat diving from Botany Bay, the sea conditions are such that we have to dive inside the actual bay. When the swell and winds are from the south or south-east, then we dive in the area near The Leap. in the middle. See the stairs upper right. From the water, the location of The Leap starting point is fairly obvious. National Parks and Wildlife Service has built a really good set of stairs down from the car park to the rock platform and you can see this clearly. Basically, this dive is to the north-east of that location. You can do this as a normal dive or a drift dive. For a drift dive, you need an incoming tide as it would be not wise to do on an outgoing tide. To find the site, head from the north and when your depth sounder shows you are over the reef, drop anchor (or enter the water if a drift dive). A rough GPS location is S34° 00.3406' E151° 13.8670' using WGS84 as the datum. The depth will be about 13 metres. Once you enter the water and drop to the bottom, head to the north and you should shortly see the edge of the reef. Depending on exactly where you are, it will either be a shear drop from 15 to 20 metres or a more gradual drop. Once on the sand, head east and follow the wall. The wall is really nice, with lots of small gorgonias, sponges and sea squirts. There are also lots of small overhangs which are home to cuttlefish, octopus and sometimes eastern blue devilfish. Head east for 10 minutes or so before turning around and going west. If you go anchored, you could go further before turning. The wall actually turns a bit to the south-east and then south if you go far enough. Once you are heading west on a drift dive, go as far as you can before you need to ascend. The wall is even more spectacular to the west of the starting point and the depth is a bit more at 21 to 22 metres. On this dive you may see sea horses, sea dragons, pygmy pipehorses and possibly anglerfish. There are all the normal Sydney reef fish like seapike, yellowtail, mado, ladder-finned pomfrets and more. For an anchored dive, head back east again after going 10 minutes past the anchor area, otherwise head west for a bit more. You can get about 40 minutes on the bottom here. On a drift dive, send up a safety sausage and ascend. You should be far enough away from the shore to not have to worry, but if in doubt, swim slowly to the north as you do your stop. An excellent dive, very colourful.